Just before we lifted the boat, I noticed the cockpit speaker was cracked. I don’t remember doing it but I must have kicked it in a frenzied moment. Worse, it had become loose in it’s fitting – alarming because water could get in and the fuse box etc is located perilously close inside. It had been fastened with four very short screws. I have fitted a new one, bolting it to the bridge deck and sealing it with copious sealant. 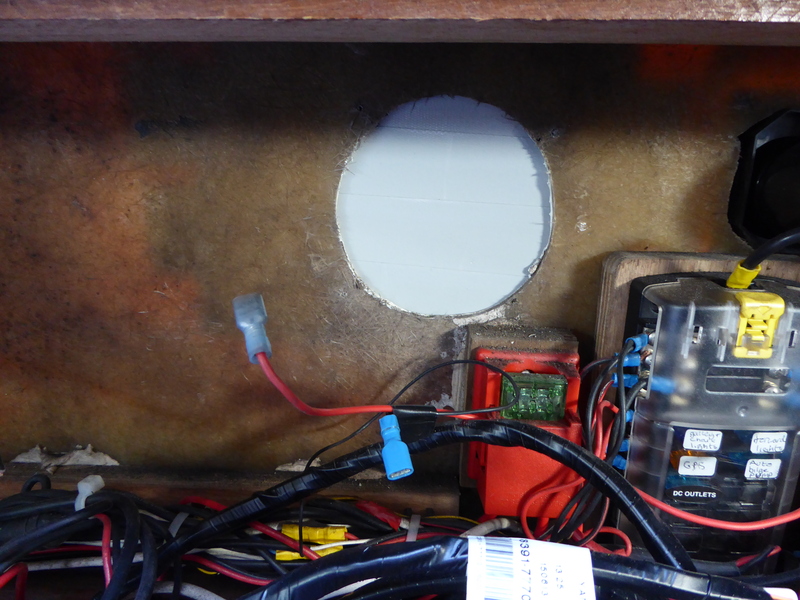 I debated doing away with it altogether and sealing the hole – (or moving the electrics). Maybe the new speaker is the easy way out but it does allow me to hear the radio from the tiller. I have rigged a downhaul for the genoa/foresails. It is one of those why-didn’t-I-do-this-before jobs – so obvious. The line is 6 mm 3-strand to allow an eye-splice. It is fed down the port side stanchions through stanchion bulls-eyes to a stanchion cleat level with the winches in the cockpit. Logically is should go down the starboard side as the fore halyard is fed back to the cockpit on this side, but the forestay and fittings are slightly to port in the bow to allow the anchor chain to flow freely. If the downhaul was to starboard, it would interfere with the anchor chain. One of the benefits of taking photographs is to be able to sit in comfort and criticise your work. I will improve the knot and extend the whipping on the eye splice. Now for the dilemma. The refit list is building and the if-it’s-not-broke-don’t-fix-it alarm is flashing. 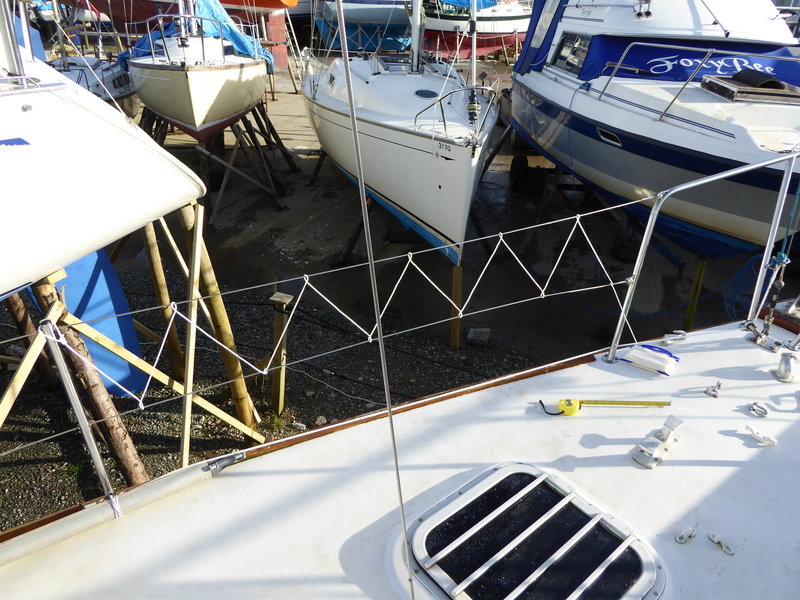 Steel lifelines were on the boat when I bought her but steel lifelines would be impossible to cut away in an emergency and I would prefer to replace them with Dyneema line. Given that costs are mounting, do I do this now or wait until next year? It’s the juggle between costs and safety. And, yes, I do know the risks associated with both. 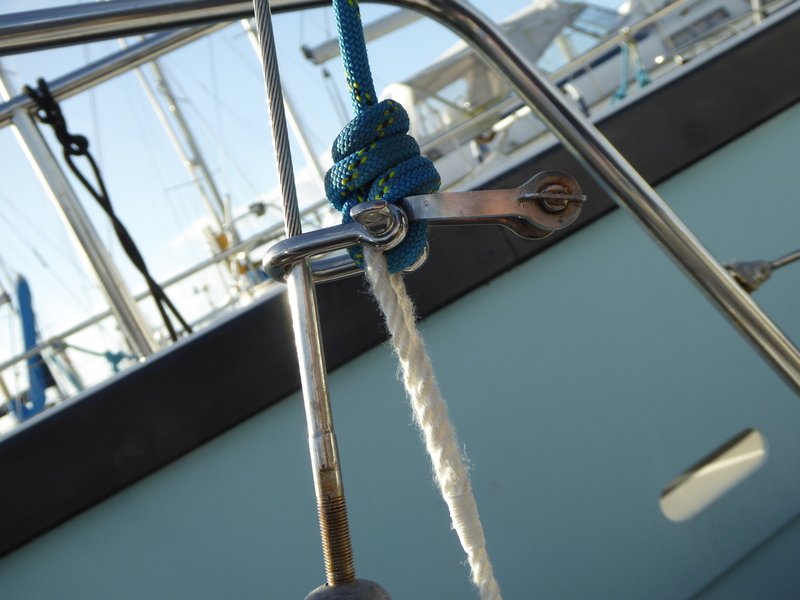 The safety and emergency sections of the chandlery catalogues are growing exponentially. How did we manage before? I am going to lace the forward lifelines. Here sizing it up. I will place lacing eyes in the toe-rail. Another why-didn’t-I-do-this-before job. Netting would be an alternative but I wonder about visibility looking forward from the cockpit. We shall see whether this works. It will mean lowering foresails without having to go forward immediately. I’m all for it.